I am so excited for today's giveaway! I am a total children's lit junkie. to see who had the most picture books in their library. She's still teaching, so I'm sure she's surpassed me by now. new book that is so cool! Masha D’yans is an award-winning artist. Her line of greeting cards, clothing, and home décor, featuring her alluring artwork, are sold at Target, Macy’s, Urban Outfitters, Nordstrom, as well as other major retailers and smaller specialty shops. Originally from St. Petersburg, Russia, and classically trained at the St. Petersburg Academy of Art Lyceum and subsequently at Cooper Union in New York City, she now lives and works in Manhattan. Razzle-Dazzle Ruby is her first book. Visit her at www.masha.com. It is seriously darling and Isabella loved it!!! so she got to enjoy it all by herself. that goes on in this fun, interactive book. Isabella was enthralled from the moment she opened the book. The sparkles had her at the first page. She loved all the pop-ups, spinners, and pulls. striped tights just like Ruby wears and a copy of Razzle-Dazzle Ruby! and tell me which part is your favorite! This GIVEAWAY will end on October 25th at midnight PST. 2 lucky readers will be selected using Random.org and will have 72 hours to claim the prize or a new winner will be chosen. 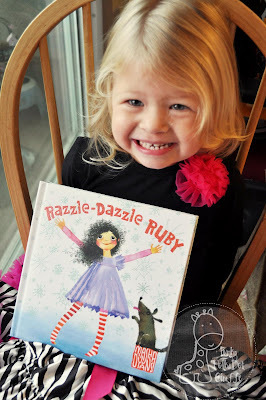 Disclosure: I was given a copy of Razzle-Dazzle Ruby to preview. I read it because I love children's literature and adore a good picture book. I blogged about it because I wanted to and not because sparkles or twirls influenced me. All the thoughts & opinions are mine. I loved the snowman, and of course the little giggles in the background! I really liked when she was ice skating how there were little fish looking up from under the ice. Too Cute. The pop-up scarf is really cute and the big rolling snowball. What a fun book!! Pick me!!! I love the music they have going while showing the story! its perfect for that book!! 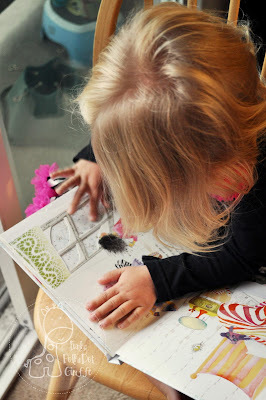 I would love this book for a friend of mine's daughter!! she would love it! i love scholastic also! as a former pre-k teacher i used to always order from them however now that i am a SAHM I don't get to get the books order now. Now I sell for Usborne Books and More. If your ever looking for great books check them out : www.myubam.com/N3412 you can order from the site and the books ship straight to you!! I love children's book & this looks so sweet. I watched the video & thought the illustrations were wonderful & I love the interactiveness of the book. 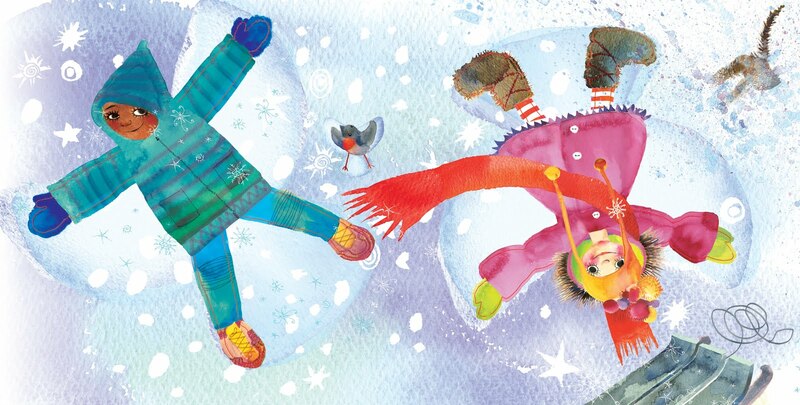 Love the spinning snowman and snow angels! Kelsey and I love the snowflakes falling in the window! My son loves the snowman and I love when they make snow angels. What a cute book! I loved the spinning snowman in the video, but really the whole book looks great. My kids would love the interactive story! Wow! That is a cute video and such a teaser... now I really want the book! I wanted it before because I am always looking for interactive book to help my sons find reading more interesting. The snowball rolling part of the movie was where I got super excited to have the book in my hands! Thanks for the opportunity to win it. I love how the book is interactive! My favorite part was the rolling snowball. Soo cute! I love the snow angels and the part where the dog is peeking out.